Thirteen years ago, I watched in horror as Bill Clinton signed Welfare Repeal a few days before the Democratic Convention – forcing progressives like Tom Hayden to explain on the Convention floor how they would “submerge” their objections so we could re-elect a Democratic President. Yesterday, I watched Ohio Senator Sherrod Brown put on the best spin he could on how Democrats have surrendered to unprincipled extortionists like Joe Lieberman. For months, Brown argued that liberals had compromised enough on health care – and there was no reason why 51-plus Senate Democrats should capitulate to the whims of five conservatives, as polls consistently show a public option to be popular. But with White House Chief of Staff Rahm Emanuel bullying the Senate to cut a deal – any deal – just to save face, the pressure proved too much. Those who hoped Obama would use Rahm to strong-arm a liberal agenda were wrong. If the President really cares about “change,” he wouldn’t have his henchman dampen progressive spirits. Make no mistake about it. The health care “compromise” in the Senate is anything but – and we’re better off killing the bill. Requiring everyone to buy health insurance without a cap on costs is merely a subsidy to private insurance. As Obama said during the campaign, people don’t lack health insurance because they aren’t being forced to buy it. We can stop denials for pre-existing conditions, but without a public option that competes with private insurance the companies will simply raise their premiums. All they care about is obscene profits, and competition keeps them honest. The public option may not have covered a lot of people, but it was essential at keeping the entire reform package meaningful. Without it, we just have a false bill of goods. And don’t let politicians get away with saying “we can’t make the perfect the enemy of the good.” That doesn’t work when you try negotiating with those who are unreasonable. Joe Lieberman even admitted yesterday that the only reason he sank the “Medicare for 55-year-olds” compromise (after Democrats abandoned the public option) was because liberals started saying good things about it. When you’re dealing with a narcissist Senator whose prime desire is to torture progressives, nobody who gives a damn about good public policy would want to come up with a deal that appeases him. Conventional wisdom says the Obama Administration is so intent on passing a bill (and terrified that failure will repeat the debacle of 1994) that they don’t really care what is in it. Which is why conservative Democrats who are bought and sold by the insurance industry have had the upper hand. But if success was really the White House’s primary motive, the President had ample opportunities to dispatch his attack dog – Chief of Staff Rahm Emanuel – on Blue Dog Democrats. Why didn’t he ever tell them they are holding up an historic opportunity for reform, and enabling Republicans who want Obama to fail? Instead, Emanuel only got tough on progressives when they fought to salvage reform. Obama has always encouraged the grassroots to put pressure on Congress to pass health care. But when liberal groups targeted obstructionist Blue Dogs, Emanuel slammed them for attacking “other Democrats.” Meanwhile, Joe Lieberman flip-flopped on the Medicare compromise to piss off liberals – but Emanuel didn’t pay him a visit and give him an ultimatum. He instead pressured Harry Reid to cave, because we “must” pass a bill. Which is not a surprise if you know Rahm Emanuel. As Chairman of the Democratic Congressional Campaign Committee, he recruited anti-progressives like Heath Shuler and Tammy Duckworth to run for Congress – using the same failed strategy Democrats had been trying for over a decade. Republicans lost Congress in 2006, but not because of Rahm. 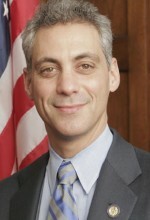 Voters turned against the Iraq War that Emanuel initially supported, and Howard Dean’s Fifty State Strategy that Emanuel had bitterly opposed paid off. The freshman Democrats from 2006 were not conservative, and people like Rahm Emanuel have undermined the Left for years. Refusing to keep obstructionist Blue Dogs in line (but attacking those who try) is not “fighting like crazy” to enact a progressive agenda. Urging the Senate to cave to the unreasonable demands of an egomaniac who campaigned for John McCain is not “fighting like crazy” to enact a progressive agenda. Letting the health care process drag for months – remember Obama’s August deadline for Congress to pass reform? – is not helping progressives, nor has it helped the President’s political fortunes. Nor has it helped the Democratic Party’s chances at keeping their majority in Congress for 2010. If President Obama has allowed Rahm Emanuel to dampen liberal spirits, did he ever have a progressive agenda in the first place? Because I’m starting to get a scary sense of déjà vu from the dark days of the Clinton Era – when a Democratic President had no qualms throwing his most loyal progressives supporters under a bus to appease the Right.